Cooked this yesterday to share with a friend; mentioned it to another friend and had to promise to share the recipe, so here it is. I cooked mine in my Dutch oven, so it could go straight from the hob to the oven, but you could start the filling off in a good size saucepan and then transfer it to a casserole dish to bake. While the oven is coming to temperature, heat the oil over a low to medium heat and sweat the onions and garlic until softened, stirring regularly. Add the mushrooms and cook for about five minutes, until softening. Add the sweet potatoes, caraway seeds, and stock; stir well and bring to the boil. Then simmer uncovered for 15 to 20 minutes. Meanwhile combine the topping ingredients and work between your fingertips until the mixture resembles coarse breadcrumbs. Stir the chickpeas into the filling. Drain of any excess liquid (I think I poured about 2 tablespoons away). Add the crumble topping and bake for around 30 minutes. If topping with cheese sprinkle it over the top about 5 minutes before the end of the cooking time. Easy to do a vegan version by replacing the butter with dairy free spread (I like Suma Sunflower Spread for baking) and skipping the cheese. For a gluten free version I would probably use buckwheat flour. I was baking brownies to share this weekend and, because we all have different dietary requirements, they needed to be everything free. Well, not everything free, but dairy, gluten, and soya free, and ideally palm oil free as well. The gluten free need was easily met; if I don’t have time to risk an experiment not being good enough to share or if I just want a quick and easy substitute flour for a recipe that would usually use wheat I fall back on a gluten free flour blend I know I can rely on. Avoiding dairy, soya, and palm with fat that would behave a lot like butter was a more interesting challenge. I decided to try coconut oil. You don’t have to buy expensive virgin coconut oil for these though, there’s no way you’d be making my brownies as part of a health food kick, I used the cheapest I could find and it worked just fine. I may experiment more with different flours and maybe adding walnuts or chocolate chips but given that these were squidgy yet slightly crumbly, with a thin, crisp top I’m happy with how they turned out, and given how rapidly the pile on the plate went down I think others were happy too. Pre-heat oven to 170ºC fan oven (I think that’s about 190ºC without fan or Gas Mark 5). Grease and line an 8″ square baking dish or tin. Mix the sugar, flour, and baking powder together in a large bowl. Beat the eggs and whisk thoroughly into the dry ingredients. Stir in the chocolate and coconut oil. (Add any extras you fancy like chopped walnuts or dried cherries at this stage). Transfer the mix to your baking dish and bake for 20-25 minutes (it should be crisp on top but still slightly soft. Allow to cool in the baking dish for about 10 minutes before turning out onto a wire rack. Darker days see me wanting more comforting food. Nothing beats good bread for comfort food; whether it’s still warm from baking alongside a bowl of soup or a thickly buttered doorstep topped with home-made jam, it’s food for the soul as well as the stomach. This loaf isn’t quite as rich as my Honey and Walnut Loaf but it’s still good autumn fare. As usual the instructions are for a bread machine, my hands and kneading bread don’t mix well. Put all the ingredients except the sunflower and pumpkin seeds in your bread pan, in the order recommended by the manufacturer. Select the Whole Wheat Raisin setting. Add the sunflower and pumpkin seeds at the raisin beep. I haven’t baked quite as much this year as last but I have tried to stick to my goal of a different loaf each time I bake. This loaf was an experiment which turned out so nicely I may find myself having to repeat it before the year is out. 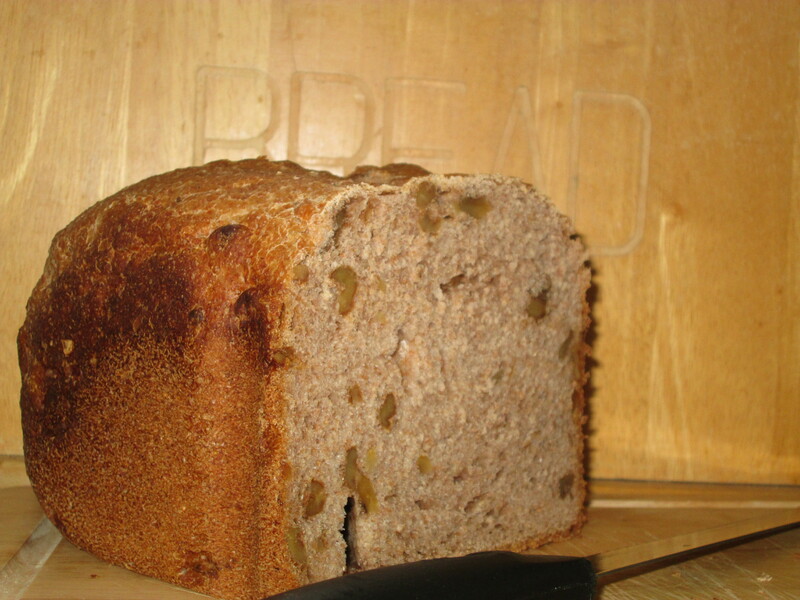 With a warm, rich flavour from the heather honey I used, this is a comforting loaf for cold, damp days. Add all the ingredients except the walnuts to the bread pan of your bread machine, in the order specified by the manufacturer. Add the walnuts at the raisin beep. Enjoy the aroma that fills your kitchen as the bread bakes, try not to eat it all in one go! The second marrow I had to stuff this autumn was enormous; about 18″ long and with much of it’s diameter 6.5″, I knew I was going to need a lot of stuffing. I made double quantity of my cheesy, nutty stuffing but it wasn’t enough; about a third of my marrow was still unstuffed. In desperation I trawled my cupboards to see what else I could make a stuffing with, the result was more successful than I had dared to hope. The recipe should give enough stuffing mix for most store bought marrows. Slice marrow into 1.5″ to 2″ rounds, scoop out seeds and pith. Place marrow rounds on a lipped baking tray or in a roasting dish, stuff, bake for about 1 hour. Marrows seem to be a much neglected vegetable. 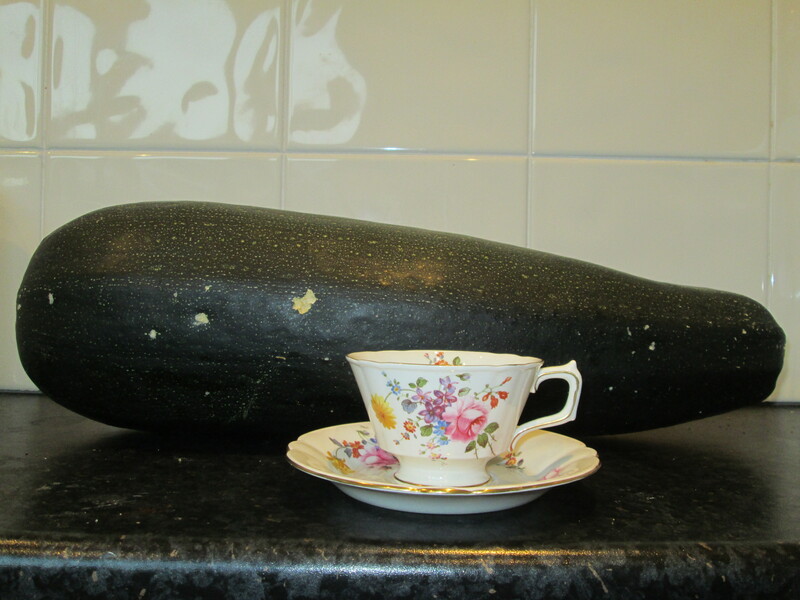 When I mentioned to people recently that friends had given me two beautiful, and in one case giant, marrows from their garden the typical response was “that’s nice, but what will you do with them?”. I did consider making marrow rum but in the end both got stuffed. For the cheese I use St Helen’s but there are goats’ cheddars and goudas which would work. Breadcrumbs; don’t buy dried! Use fresh or do what I do and make a batch in one go when you get a nice stale loaf and freeze them in useful portions. Milk; personally I’d use a nut milk, macadamia or unsweetened almond for preference. Mix all ingredients except the marrow together in a large mixing bowl, it’s easiest just to get your hands into the mix than try to stir it all together with a spoon. 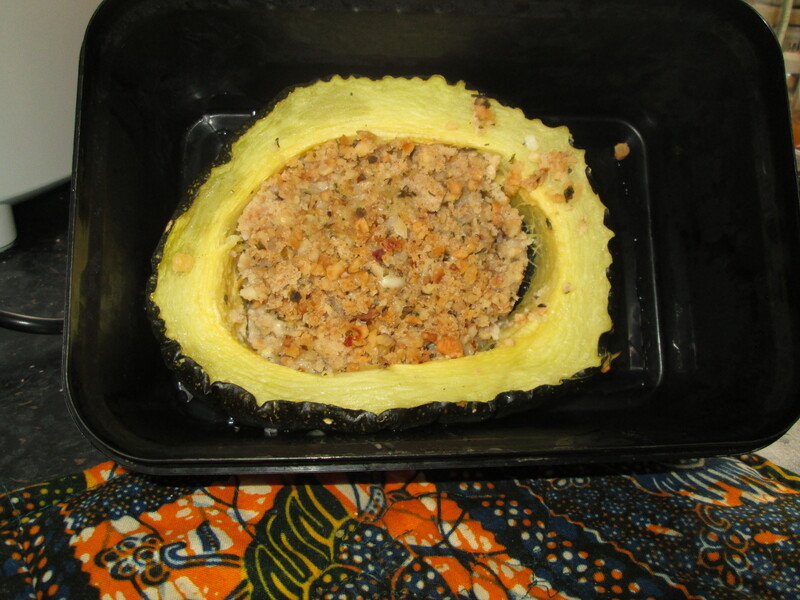 Leaving the stuffing to stand, cut the marrow into 1.5″ to 2″ rounds and scoop out the seeds and pith. 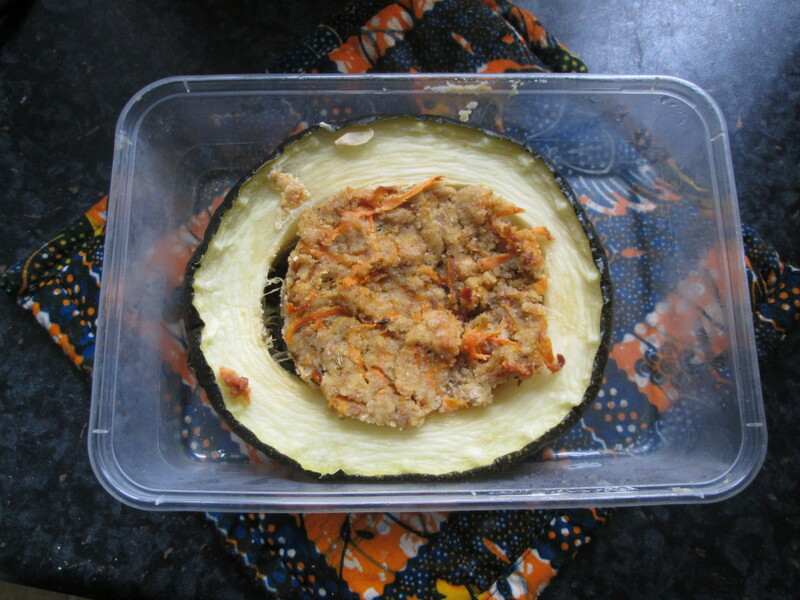 Place the marrow rounds on a lipped baking tray or in a roasting dish, fill with stuffing, bake for about an hour. Any spare stuffing can be baked in a small pie dish or ramekins. I’m used to the idea of foraging for autumn berries, foraging for orchard fruits is a new one to me! 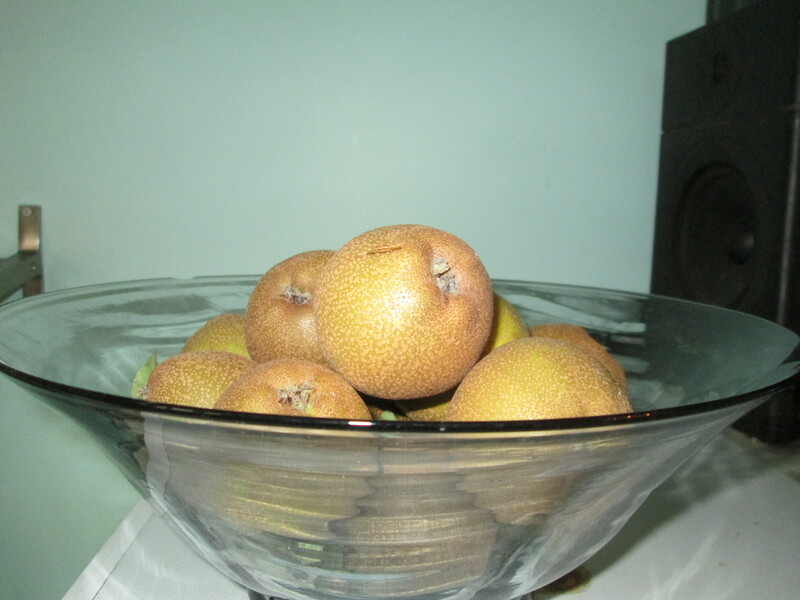 A recent trip on the local canal saw my Dad and I picking pears that were overhanging the water; small, crisp and slightly tart, these were an unexpected bonus to a pleasant day out. When a neighbour gave me a bagful of very sweet windfall apples I felt I had the perfect combination for an autumnal crumble. I used my smallest diameter casserole dish, which is 6.5 inches, for an 8 inch casserole dish increase the quantities by 50%. Preheat oven to 160ºC fan or 180ºC conventional. Make the topping by all the ingredients except the flaked almonds together between your fingers until you achieve your preferred crumble consistency. Set aside. Core the fruit and chop into roughly ½ inch cubes. Toss the fruit in the orange juice in your casserole dish. Add the star anise, evenly spaced. Cover the fruit with the crumble topping and sprinkle flaked almonds over the top. Bake for approx’ 1 hour.